When I wrote my blog entry about vegan Glasgow, I was hugely remiss in not mentioning the Bay Tree on Great Western Road. 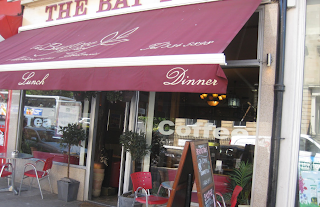 The Bay Tree has a long history of serving vegan food in Glasgow (the restaurant has been around since 1960). It used to be entirely vegan, but the original owners sold. The current owners have started serving meat and dairy, but there are still plenty of vegan options on the menu, including milk shakes, ice cream and smoothies. It's a Mediterranean restaurant, so there are also plenty of options like hummus, dolmados, fatoush, vegetable stew, korma sabzy (spinach, leeks, lemon, beans, herbs and spices with rice or couscous) and a mezze platter. The service is very friendly, and the prices are very reasonable, and it's BYOB with no corkage fee. For a great, informal meal, you can't do much better.